Every child should learn to swim so that they are safe around water. If you have yet to teach your children the basic principles of swimming, now might be the best time to get started. If you are a strong swimmer yourself, you probably have loads of advice when it comes to educating your kids. 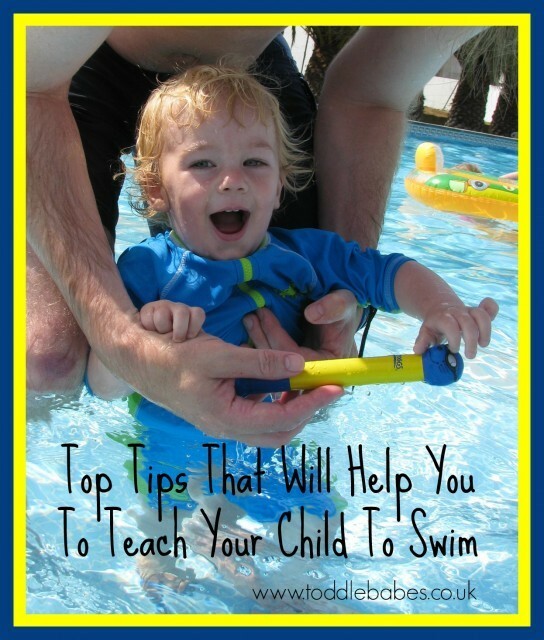 Here are some top tips to help you teach your child to swim. The sooner your child gets in the water, the sooner they will learn to swim. You have a natural instinct to protect your little one, which is understandable. If you don’t expose your child to water early on, though, they might develop an irrational fear of swimming. That could cause you loads of issues later down the road, and so it is best to address them now. To begin with, focuses on water games, swimming-readiness skills, and safety in and around the pool. Encourage him to blow bubbles in the water so he’ll learn to get his face wet without swallowing water. Avoid water wings, air-filled swimsuits, and inflatable flotation toys. your child will sink if they deflate, and these toys give a false sense of security. If you feel you would really rather have something more than the basic swimming costume and cap, have a look at your sport shops for swim aids that are teacher approved. These will help you teach and most are not overly buoyant and therefore encourage children to learn to float independently. The sooner your child can float unaided the safer he will be around large bodies of water. Much of the time, children find learning to swim boring. They’d rather be playing and messing about than learning the strokes and water safety. You need to try to make the experience fun for your kid so that they associate it with enjoyment. Click here for information on some pool games that you could play with your little one. If you make the entire event into an exciting activity, you will find that your child learns fast. You might think that you need to start teaching your child strokes right away, but you don’t. In fact, the first thing you need to worry about is building their confidence. The thing that holds most children back is the fear that they will drown. You need to help your kid get over that fear. Encourage your child to swim and don’t worry about helping them with their technique. If you spend too much time criticizing your kid, they will not want to learn. It is crucially important that your little one listens to you when you tell them what to do. If you have any problems with this issue, you need to get out of the pool. It is unsafe for your child to disobey you when they are swimming. You need to let them know that they have to listen to you no matter what they think. As a general rule, you should always stay no more than a couple of feet away from your child. If your little one starts to struggle, you want to be as close as possible so that you can help them. When they are swimming, swim closely next to them or behind them. Make sure that you watch out for any warning signs that might mean they can’t cope. That way, you can be sure that your child is always safe in the water. It will take a whole lot of patience on your part to teach your child to swim. You will need to take things slow at first so that you can teach them everything well. If there is anything that your child is uncomfortable with, you should leave it for a moment and come back to it later. In time, they will learn to swim, and you won’t need to worry as much.